Grewelthorpe: Bain. Bayne. Baines. Family. Information from Parish registers, school records, census and memorial inscriptions [M.I.] about the Bain family in the Grewelthorpe area. There are several variations on spelling of this name. George Baynes would like information about William & Richard Baynes who had a bookshop in Paternoster Row, London. 1790 – to 1850’s. ANN BAYNES. Died 25 August 1788. MI Masham. Dau of John & Ann. ALICE BAYNE. Bap 20.3.1657 Grewelthorpe. Dau of William & Ellin Matthew. ALICE BAIN [Nee ?]. Buried 31.1.1724 Kirkby Malzeard. Widow living Grewelthorpe. ALIZ BAYNES. Bap 1657 K.Malzeard. Dau of William & Ellin of Thorpe. ANN BAINE. Buried 23.3.1684 Kirkby Malzeard. Wife of Richard jun. ANNE BAYNE. Bap. 28.6.1685 Grewelthorpe. Dau of Roger. ANN BAINE. Bap. 26.11.1704 Grewelthorpe. Buried 21.12.1704. Dau of John. ANN BAINES. Bap. 10.4.1822 Aldfield. Dau of Michael [shoemaker] & Margaret. ANNA BAINES. Born C. 1785. Died 19.6.1863. Dau of John the surgeon & Henrietta Hardcastle. Married  John Lodge Battley. of Masham. on 23.8.1810. He died 19.5.1820. Married  Charles Harrison. Barrister at Law. on 25.5.1822. He later became MP for Beverley under the name of Battley. ELENOR BAINE. Bap. Grewelthorpe. Son of Roger. LADY ELEANOR BAYNE. 1782 Inclosure Award Grewelthorpe. Land [4acres 1 rood 18 perch] at Low Moor, Nutwith Side, Grewelthorpe. Land [3acres, 0 rood, 20 perch] at Low Moor, Hutts Road, Grewelthorpe. ELLEN BAINE. 30.9.1689. Will proved. widow of Grewelthorpe. ELLEN BAINES. Born C. 1749. Lived Grewelthorpe. Buried 9.5.1820. Ref. Kirkby Malzeard Par. reg. ELIZABETH BAYNE. Bap. 15.9.1700 Grewelthorpe. Buried 17.9.1700. Dau of John. ELIZABETH BAIN. Buried 21.11.1729 Kirkby Malzeard. Wife of John of Grewelthorpe. ELIZABETH BAINE. Buried 24.1.1730 Kirkby Malzeard. Lived in Grewelthorpe. ELIZABETH BAYNES. Bap. 11.4.1814 Aldfield. Dau of Michael [shoemaker] & Margaret. ELIZABETH BAINES. Born C. 1827. Dallowgill. Buried 11.12.1841 Kirkby Malzeard. ELIZABETH BAINES. Bap. 3.4.1859 Kirkby Malzeard. Dau of Mark & Ann. EMMA BAIN [nee Moore]. Born June 12 1889. Buried 11.3.1967 Grewelthorpe. M.I. Wife of Lawrence D.M. Dau of Thomas & Rebecca Moore. See Photo at end. Se Also Moore family page. HANNAH BAINS. Died 1 Sept 1765 Masham. She was a Quaker and was buried in The Friends burial ground at Low Ellington. She was about 59 yrs. HANNAH BAYNES. Dau of John & Ann. Sister to John & Richard. Married Armstrong Stawpert. HENRIETTA BAINES. Born C.1782. Died 9.8.1806 Masham. Dau of John the surgeon & Henrietta Hardcastle. HENRY BAINES. Bap. 3.4.1684 Grewelthorpe. Son of Robert. HUMPHREY BANE 1633. Of Somerfield. His wife was presented to the ecclesiastical court on 13.9.1633 for not coming to church to give God thanks for her safe deliverance in child birth. She was later excommunicated as a Popish recusant. JOHN BAINE. 22.3.1651 Will proved. JOHN BAYNE. Bap 23.7.1655. Grewelthorpe. Son of Richard & Anne. JOHN BAINE. Bap 1657 Grewelthorpe. son of Richard & Anne. JOHN BAYNE. 1.5.1698 Married Elizabeth Burniston. of Grewelthorpe. JOHN BAYNES. Born C1732. Died 13 Dec 1813. MI St Marys Churchyard Masham. Married Ann who died in 1815 aged 80. JOHN BAINES. Born C1760. Died 5.5.1821. Masham. he was a surgeon in Masham. married Henrietta Hardcastle. 5 children. JOHN BAYNES. Born C1770. Died 22 March 1831 aged 61. MI Masham. Son of John & Ann. JOHN BAYNES. Born C1777 Kirkby Malzeard. In 1851 he was a retired maltster in Bishop Stortford. Herts. JOHN BAINES. Born C. 1852 Kirkby Malzeard. Son of Mark & Ann. JOSEPH BAINE. Bap 27.2.1663/4 Grewelthorpe. Son of Richard jun. & Anne. LAWRENCE D.M.BAIN. Born 9 Feb.1890. Buried 17.6.1959. M.I. Grewelthorpe. Husband of Emma Moore. [born 1889]. Stonemason. Living Hillside Grewelthorpe in 1939. 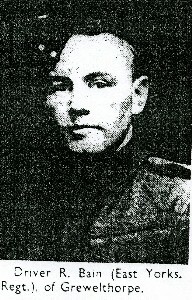 LAWRENCE D.M. BAIN Jr. Born 9th May 1922. Son of Lawrence & Emma Moore. 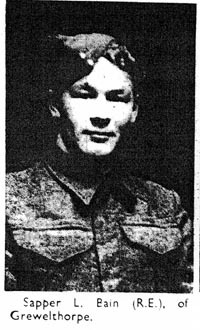 Labourer in 1939. LUCE BAIN. 7.5.1608. Widow made a will. MARGERY BAYNE. Buried 26.5.1692. Wife of Richard senior. MARGRET BAYNE. Buried 27.8.1658 Kirkby Malzeard.. Wife of Robert. MARIA BAINES. Bap. 17.5.1853 Kirkby Malzeard. Dau of Mark & Ann. MARK BAINES. Born C. 1799. Died C1873. son of William a carpenter.1st wife Mary [b.1790] a straw bonnet maker. They had 4 children. Mark was a widower when he married Jane Morland [nee Johnson.] a widow[b.1819] on 6.10.1863 at Kirkby Malzeard church. Jane was dau of John Johnson. Mark was a labourer on the roads. Lived in Kirkby Malzeard all his life. MARK BAINES. Born C. 1826 Kirkby Malzeard. Son of Mark & Mary [Straw bonnet maker]. Married to Ann [b.1826.] Lived K.Malzeard 1861. MARY BAYNE. Buried 17.9.1685. Dau of Richard jun. MARY BAINES. Born C1799 Masham. Died 19.6.1799 Infant. Dau of John the surgeon & Henrietta Hardcastle. MARY BAINS. Bap. 22.12.1811 K.Malzeard. Dau of John of Mickley. [Ref. Par Reg]. MARY BAINES. Born C. 1830. Dau of Mark & Mary [straw bonnet maker] of Kirkby Malzeard. Married on 19.4.1851 Kirkby Malzeard to Thomas Wood. son of William Wood. [Ref. K.Mal.Par.Reg.] Mary was a straw plait manufacturer in 1851. MARY JANE BAINES. Bap. 15.5.1864 Kirkby Malzeard. Dau of Mark & Ann of Kirkby Malzeard. MARY BAINES. Born C. 1870 New Wortley. Niece of Ascough Beck. of Grewelthorpe. Mary was a machinist living Ripon in 1891. MARY GERTRUDE BAYNES. Bap. 28.5.1871 Mickley. Dau Joseph & Eliza of Scotton. MATTHEW BAINS. 1634 – 1641. Appeared in ecclesiastic courts in Masham for various infringements including carding on the Sabbath. MICHAEL BAINE. 22.1.1613. Made a will. Blacksmith, Grewelthorpe. M.BAYNES. 1782 Inclosure Award, Grewelthorpe. The widow of M.Baynes had land [1acre, 13 rood, 12 perch] at Low Moor, Nutwith Side, Grewelthorpe. MICHAEL BAINES. Bap. 10.10.1824 Aldfield. Son of Michael [the shoemaker] & Margaret. MICAHEL BAINE. Born C. 1840. Buried 14.3.1858 Mickley. RICHARD BAINE. 6.5.1652. Will made. Yeoman of Bramley Grange. RICHARD BAYNE. Bap 19.4.1657 Grewelthorpe. Buried 18.2.1690. Son of Richard & Margery. RICHARD BAINE jun. 13.2.1689. Will proved. Yeoman of Newstead Grewelthorpe. RICHARD BAYNE. Buried 22.1.1704. Son of John. RICHARD BAINES. Bap. 21.2.1778 Grewelthorpe. 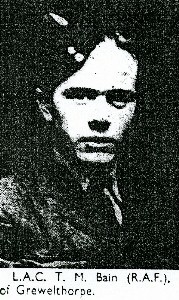 Son of John of Bramley. RICHARD BAYNES. Born C1778 Kirby. Apprentice to William. Book seller in Paternoster Rd. London. [ref. 1851 census] Died 2.7.1853 age 75. in London. Son of John & Ann of Masham. ROBERT BAINE. 23.1.1649. Made a will which was proved on 28.1.1649. Yeoman of Grewelthorpe. ROBERT GEORGE BAIN. Born 5.7.1919. Buried 18.8.1982. M.I. see photo. Son of Lawrence & Emma Moore. Married in 1940 to Florence E. Wood. Gen. Labourer. ROGER BAYNE. 17.3.1639. Made a will. Yeoman of Grewelthorpe. ROGER BAYNE. Bap 13.12.1653 K.Malzeard. Son of Richard the younger & Anne of Thorp. [Ref Par Reg]. SARAH BAINE. Bap 21.11.1675 Grewelthorpe. Dau of Robert. SARAH BAYNES. Born C. 1756. Buried 29.8.1840 Kirkby Malzeard. SARAH BAYNES. 1782 Inclosure Award Grewelthorpe. Had land [2 roods 14 perch] at Low Moor, Nutwith Side, Grewelthorpe. SARAH BAINES. Born C. 1797 Kirkby Malzeard. Unmarried in 1861 [Kirkby Malzeard] living with brother William. SARAH ANN BAINES. Born C1838 Dau of Mark & Mary [straw bonnet maker] of Kirkby Malzeard. Married on 4.10.1858 to Robert Mawer. [b.1834] Markington. son of William Mawer. Sarah was a bonnet maker. SYTHE BAYNES. Bap. 10.2.1690 Grewelthorpe. Died 9.5.1691 Grewelthorpe. Illeg. son of Alice Baynes. THOMASIN BAIN. 4.3.1668. Will made and proved. Widow of Grewelthorpe. THOMAS BAYNES. Bap. 19.4.1818 Aldfield. Son of Michael [shoemaker] & Margaret. THOMAS BAINES. Bap. 28.11.1855 Kirkby Malzeard. Son of Mark & Ann. THOMAS MOORE BAIN. Born Jan 25th 1921. Buried 27.9.1989 Grewelthorpe. Son of Lawrence Bain & Emma Moore. M.I. 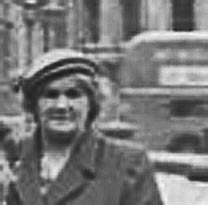 Married Hannah Jones dau of Owen Jones of Wales in September 1946. see photo. Motor Mechanic in 1939. WILLIAM BAYNE. OF Grewelthorpe married Ellin Matthew of Knaresborough. WILLIAM BAINE. Buried 27.11.1675. Kirkby Malzeard. WILLIAM BAYNE. Bap. 22.4.1699 Kirkby Malzeard. Buried 24.8.1716 Kirkby Malzeard. Son of John of Grewelthorpe. WILLIAM BAYNES. Born 29.5.1760 near Masham [ref.Family bible]. Moved to London C1780/90 and opened a book shop in Paternoster Row. Had apprentice Richard Baynes. born Kirby ref.1851 census. Could be Kirkby Malzeard. Richard died 2.7.1858. WILLIAM BAYNES. 1782. Inclosure Award. The widow of William had 83 acres, 2rood and 14 perch. At High Moor, Turf Bank, Grewelthorpe. Also a second allotment at Low Moor, Nutwith Side. Grewelthorpe. WILLIAM BAINES. Born C.1786. Died 2.8.1799. Son of John the surgeon & Henrietta Hardcastle. of Masham. WILLIAM BAINES. Born C. 1795 Kirkby Malzeard. Unmarried in 1861 [Kirkby Mal] living with sister Sarah. WILLIAM ARCHER BAINE. Bap. 31.12.1845 Kirkby Malzeard. Son of Thomas [The Tailor] & Margaret. The wedding of Miss E. Bain & Private S.Tower. in Grewelthorpe Church Feb. 1944. Report in Ripon Gazette September 1974. While excavating the foundations for an extension to Cliff Cottage, Grewelthorpe, a local builder T.Bain. [Thomas Moore Bain] uncovered a deep shaft just to the west of the cottage. The shaft, about 4ft 6ins. in diameter, is at least 30ft deep and hewn out of solid rock except for a 2ft section near the top of which is walled with sandstone. At intervals there are square cavities holding traces of some sort of wooden structure and near the bottom, there is a cupboard like space hewn out of the stone. The discovery recalled for Mr. Bain an old legend concerning a tunnel which was supposed to run from Grewelthorpe to nearby Hackfall – or to the old Roman site at Hill Top Farm. A well seems to be the answer, but few local people have ever known a well shaft sunk through solid rock. However Mrs K.M.Bumstead a lecturer in history at Ripon Training College, thinks the shaft has been a well. The feeder springs have probably been diverted by natural causes over the years. If you have found this page interesting or helpful or if you have any information to add, please contact us.